Abstract: Dexter in his secret laboratory has started experimenting on his own saliva after a painful prick of needle by Dr Dee Dee.Dexter promises that saliva being an esoteric fluid can help in detection-tearless, fearless, easy diagnosis, monitoring progress of disease. 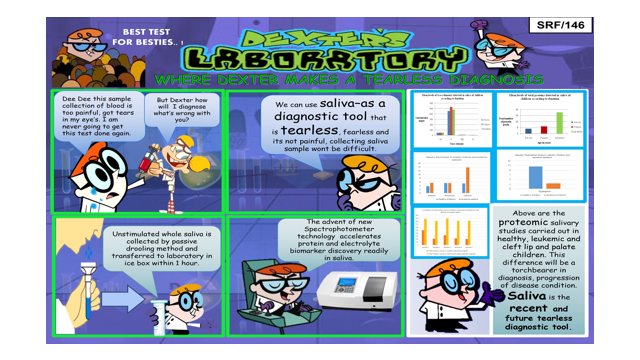 In this episode, Dexter and our team collected saliva. As saliva serves as mirror of body’s health as it contains electrolytes, proteins, hormones, antibodies, enzymes and other molecules. Saliva a recent diagnostic tool will be a torchbearer for future tearless investigations.Summary: This poster represents the importance of saliva as a diagnostic tool. in animated form. saliva serves as mirror of body’s health as it contains electrolytes, proteins, hormones, antibodies, enzymes and other molecules. Saliva a recent diagnostic tool will be a torchbearer for future tearless investigationReferences: Deshpande R, Panvalkar P, Kulkarni A, Gadkari T. Age-Related Changes of the Human Salivary Secretory Total Protein Complex and Trace Elements in Children between the Age Group of 3-16 Years. J Biomed Sci Res 2011;3(1):362-67. Deshpande R, Jadhav M, Patil V, Singh R, Mutha M, Metha B. Comparative evaluation of total salivary proteins in leukemic and healthy children of mixed dentition age group. Res J Pharm Biol Chem Sci 2014;5(1):126-30.